Military and Commercial applications | Parts and engine degreaser | Oven & grill cleaner | Floor cleaner | Brick and concrete cleaner | Remove oil and grease from mechanic hands | Cleaning of public transit | Boat and marine wash | Use full strength or diluted. Ideal for washable surfaces such as washrooms, tiles, grout, hardwood and laminate floors, locker rooms, fitness facilities, sports equipment. Use to clean up numerous spills including, coffee, wine, chocolate milk, urine, blood, etc. Safe for people, pets and the environment. See dilution chart for instructions. Liquid Green 721 Cleaner/Degreaser concentrate is formulated to out-perform its conventional counterpart. 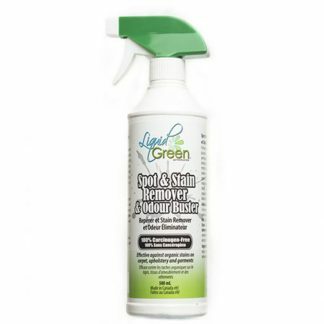 A powerful toxin-free solution that cleans with efficiency without leaving a harsh chemical residue. 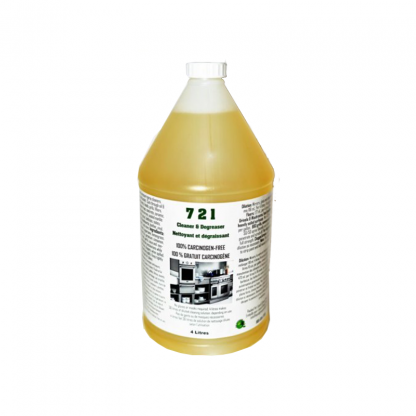 Makes 28 litres of 100% toxin-free cleaners.